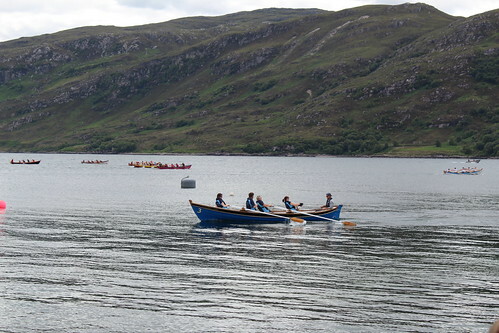 NBRC were out in force this weekend as 21 of our members took on a challenging two days of rowing up on the west coast. After the first test of beating Friday evening rush hour on the A9 was completed, we convened in the pub for some pre-race hydration as the junior races drew to a close on the beach in front of us. After livers were primed suitably, our athletes retired to the camp site where we enjoyed the silence and tranquillity of the of the Wester Ross countryside. 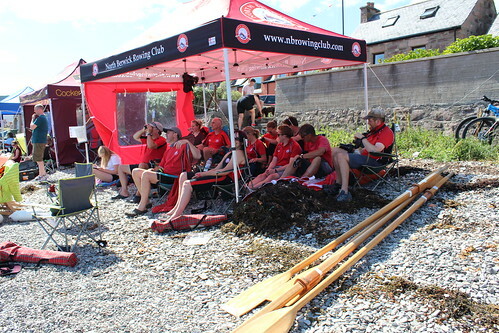 The competitors emerged from their tents and MoHo’s on Saturday morning to blazing sunshine. 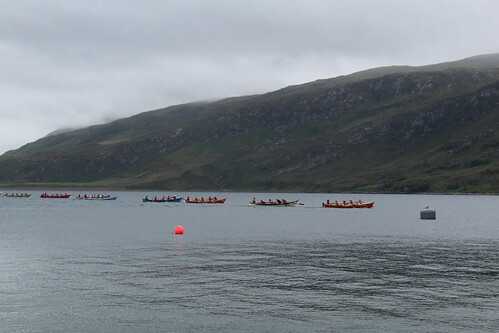 Ullapool remained uncharacteristically clammy as the ferry left and races got underway, which made for tough racing conditions despite the relatively calm waters. However, this didn’t seem to affect our over 50’s Men and Women, who started the day with some great wins against some strong teams. Heats for the open mixed A’s and 40+ mixed finished promisingly too, with North Berwick comfortably securing a place in the final for both. Heats over, but temperature rising, much fun was had as the beach was inundated by tourists, rowers and jellyfish, all jostling for a good view of the skiffs. I think North Berwick alone may be responsible for the ice cream shortage Ullapool is now suffering, but it proved an important snack to revive the team and supporters. The sense of community was uplifting as rowers from as far as the Netherlands and Orkney gathered to congratulate each other. After a quick freshen up the teams prepared for the next test of stamina; the ceilidh. There was a strong turnout up at the high school after such an exhausting day – the sheer volume of people made the assembly hall very sweaty, rendering our battle for the camp site showers pretty useless. It all went a bit blurry for me after that, either because I was spinning too fast or drinking to fast, but I remember a lot of people smiling so I think the dancing was a success. Sunday was a bit more of a dreich day (which was a bit of relief after Costa del Ulla the day before), and as we returned to the beach for the final races the wind and swell picked up. Almost opposite conditions made for a really interesting afternoon; North Berwick continued to consistently finish among the medals, and there was some excellent coxing to bring the teams home on a tight line in tricky wind. The day drew to a close and reluctantly rowers trundled off down the road, with some great memories and chests weighed down with medals. North Berwick narrowly lost out on winning overall, but of course that leaves some exciting room for improvement at our own regatta!